Joshua Fogel is Canada Research Chair in Chinese history at York University in Toronto. He has taught previously at Harvard University and the University of California, Santa Barbara. 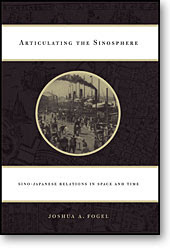 His books include Ai Ssu-chi's Contribution to the Development of Chinese Marxism, Nakae Ushikichi in China: The Mourning of Spirit, and the newly published Articulating the Sinosphere: Sino-Japanese Relations in Space and Time. I have always been a very early riser. For the past six years and a few months, I have used the wee hours to read a page of Talmud. The process of reading one page per day (daf yomi) and thus making one’s way through the entire corpus of the Babylonian Talmud in about 7 ½ years was only introduced in the early 1920s, but it ensures that those of us who do this don’t skip certain tractates and concentrate only on others. If I were reading it in the original unpointed and unpunctuated mixture of Hebrew and Aramaic, it would take me a month to read a page, but there is a beautiful, recently published, pointed, punctuated, and bilingual edition now available in 73 thick volumes. I spend between one and two and one-half hours each morning on this. I have been on sabbatical leave this past academic year and, while reading lots of books and articles related to my research, I’ve also been trying to emulate what I think of as a true intellectual (at this point, emulation is about as close as I expect to get). So, I’ve been reading lots of books that I have always wanted to but never seemed to find the time for. I occasionally buy and read a book—now, catch this—simply because it sounds interesting, despite the fact that it has nothing to do with my area of research. My research is on the history of Sino-Japanese interactions, and I have been working on a comprehensive history of this cultural and political relationship over the past two millennia. Very little on this topic is in English, but much more in Chinese and exponentially more in Japanese. I have especially enjoyed the work on ancient Japan by Inoue Hideo, Ikeda On, Okazaki Takashi, Saeki Arikiyo, Inoue Mitsusada, Ōba Osamu (whom I knew well), Suzuki Yasutami, Wang Xiangrong, and Shiraishi Taiichirō. Several of these esteemed scholars pioneered scholarship into the distinctive roles played by states on what is now the Korean peninsula in the interactions between “China” and “Japan.” Scare quotes because these are terms of much later vintage. When not reading in my field, I have recently read a spate of novels by Aharon Appelfeld in English translation. I picked up a few of his novellas some years back but found them almost too spare. I think I got the point—they’re almost all about the Holocaust in one way or another—and I attributed the underwriting to the fact that he only began to learn Hebrew after the war in his teenage years. Then, I read his memoir, The Story of a Life, about his life before and during the war in Bukovina and Ukraine and his first decades of adjustment in Israel after the war. It is a masterpiece, and clearly language is not a problem, though it is something he is consumed with. Having read so little American history in recent years, I decided to tunnel my way through Sean Wilentz’s mammoth political history of the Washington-through-Lincoln presidencies. It was great fun and I was happy to see that, in the decades since I last read U.S. history, apparently the issue of slavery had returned to center stage as the primary cause of the Civil War. I was soon disabused of this by a colleague who holds fast to an economic interpretation of the war. So, that particular debate will undoubtedly outlive us all. I have also been rereading and serially translating Liu Jianhui’s Mato Shanhai: Nihon chishikijin no “kindai” taiken (Demon Capital Shanghai: The “Modern” Experience of Japanese Intellectuals). Liu is Chinese, of course, but after earning his Ph.D. from Kōbe University he accepted a research position at the International Research Center for Japanese Studies in Kyoto. His book is a marvelous study of the centrality of Shanghai in East Asian modernity, demonstrating how most Japanese intellectuals encountered the modern world and often its Western representatives for the first time in Shanghai. He shows how Shanghai became a place of escape for them and how it also became the site in which authors began to place their fiction. My translation is appearing in an online journal I edit, Sino-Japanese Studies. Read Joshua Fogel's mini-biography at Sino-Japanese Studies. The Page 99 Test: Articulating the Sinosphere.